Ultimately, after talking to my best friend (and she’s the bestest! ), I was spurred into action. She was right. All my insecurities, all my hesitancies, all my doubts, all my worries about what would people say about my works, mean nothing if there are no works to show. I realized that I needed to treat my studio time just like another job because it is just as important than my day jobs. The first important step I took toward achieving this was saying no to a part-time job offer (which I have to thanks another amazing friend who pushed me toward this absolutely right decision). Taking on that job would mean I’d be juggling 3 day jobs, which would add up to 50-55 hours work weeks, and I’m so, so done with that life. As for painting, I’ve set up a new still-life that I’m super excited about. I’m still using those foam scraps I found in the trash a year ago (which were used in the still-life for As Is). I’m working on a preliminary drawing of it now to prepare for the painting. I enjoy drawing these shapes so, so sooooo much! I'm definitely going to make more drawings of this still-life from different perspectives. Also, I need to figure out how I can make more of the little guys so I can use them in other still-lifes. Untitled (in process), 40"x30", charcoal on paper, 2017. I’ve been working, slowly, on a hybrid print project, using both etching and woodcuts on one print. I chose a simple image of a few mushrooms. I’ve always been interested in organic/natural forms, especially in the style of the illustrations in old textbooks. Formally, this image provides just enough details/textures for me to play with without going insane. The plan is to make 1-2 blocks for the colors in the mushrooms’ caps. Plus, an etching of the gills to create a more dimensional effect and to introduce a different kind of marks in the print. So far, the key block (picture below) is carved and proof printed. Next, I need to carve the color blocks and proof the etching. Then, with some luck, all the plates will line up just perfectly. Or not. But I will cross that bridge when I get there. Proof of the key block. I started this print project to reacquainted myself with printmaking after a long period away from the printshop. My old prints, done mostly during my intro classes, are very flat and graphic. They actually look similar to this key block. Which I like just fine, but it is time to push my limits and get out of my comfort zone. 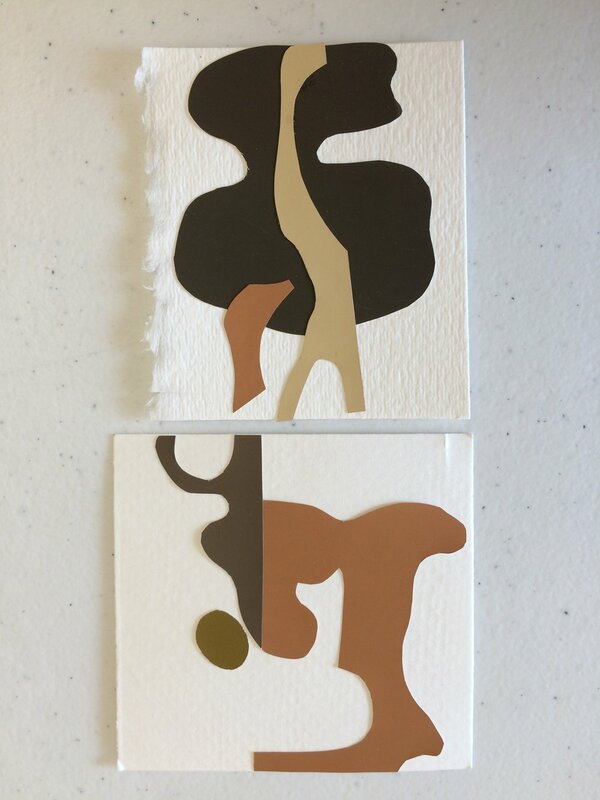 Since I started making them in the summer, the collages have evolved from merely sketches and somewhat thoughtless exercises into a more deliberate process. But after the 60th collage, it feels a bit tiresome and repetitive. The next step, I think, is to experiment with different kinds of papers (different thickness, textures) and to layer them to create a more sculptural effect. This would also allow me to play around with light and shadows within the collages more, giving them more depth. Also, incorporate more drawing elements. I have been looking at the works of Erin O’Keeffe, a contemporary photographer based in NYC, who sets up these beautiful paper still-life to photograph. Her other series of works are also fascinating, but it is these paper still-life that first drawn me to her. 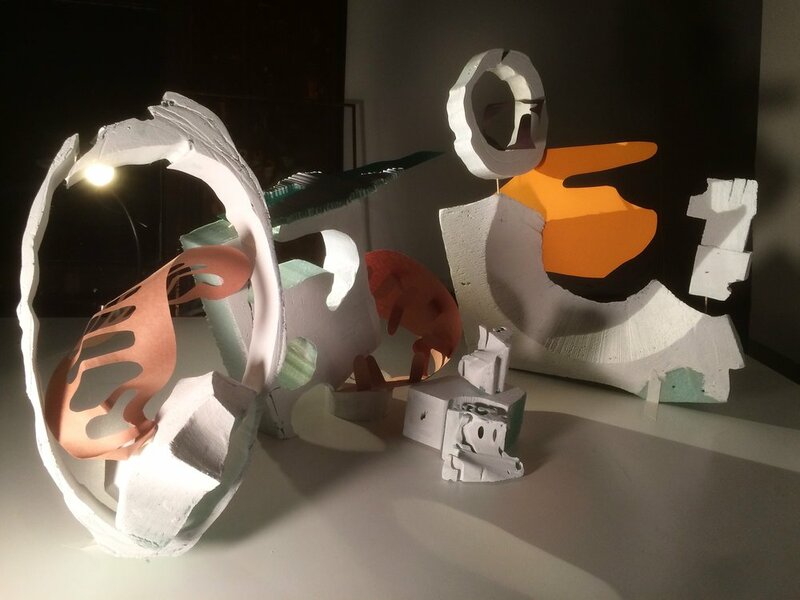 These works inspired me to try making models out of papers to paint from. I'm still having a hard time making these models since it's so different from what I'm used to before. (So full of regrets for not taking a sculpture class in college). I have gotten more and more interested in making works on papers, like drawings, collages and prints, instead of painting. I find that working with these techniques is more immediate, which allow me to work through new ideas easier and faster, before returning to painting again. I have been wanting to try overlaying etchings and woodblocks into the same prints. So maybe that will be the next project. (Once I have access to a proper printshop). Another artist I have been look at more lately is Karen Kunc, whose works are incredible and inspiring. I love the long and narrow, horizontal orientation of the majority of her prints. And her accordion books are amazing! Amy Chan is a painter and professor at UVA. Sadly, I've only had the chance to take one class with her during my undergraduate years. Her paintings on shaped panels are incredible! She also makes screenprints! I love her weird organic shapes, and her use of colors. So good! Printmaking and painting really are meant to go side by side.